Nevertheless, I began typing up some questions making sure I covered two or three other subjects other than Byzantium. I asked him an obvious question first, why he believed we have had an explosion in interest in Byzantium of recent years? 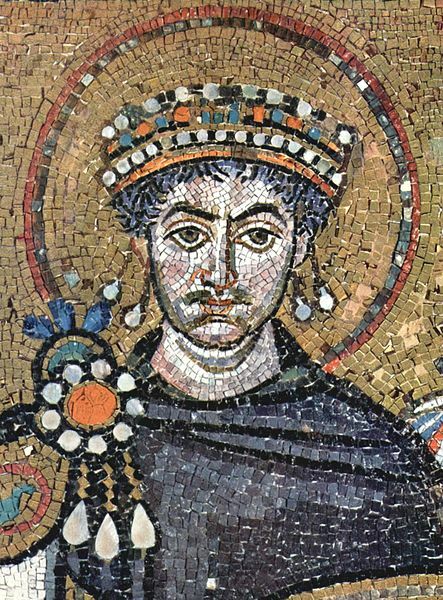 Incidentally, Emperor Justinian, above, is 1 of 5, of Lord Norwich’s favourite emperors. He lists Constantine, Justinian, Theodora, John VIII and Constantine XI as his favourite and not necessarily the greatest. His audacious attempt at telling the story of a long forgotten empire is remarkable for a man who felt somewhat daunted by the task. Yet, his story does not begin here, we must go back to his early years to discover the man who says he likes infecting people with his enthusiasm and love of history. Born in 1929, John Julius Cooper was the son of Alfred Duff Cooper, (the 1st Viscount of Norwich) and Lady Diana Cooper. His childhood seemed happy, surrounded by family and friends, but shortly after as the Second World War broke out, like many other children, he was shipped off to Toronto to study at Upper Canada College. Upon his return back to England he would continue his educated at Eton. Though his education was not strictly confided to the classroom. Through the privileged world of his father, who was a respected politician and diplomat, he would often travel to wonderful interesting cities of the world. Travelling with his father he would discover one of the most beautiful places in the world, Venice, which would in later years become somewhat of a personal obsession. As a youth he was also often surrounded by icons of the age- politicians, writers and socialites. He once famously asked General de Gaullehad if he could eat his untouched apple pie dessert, even though de Gaulle had trickled cigarette ash on it ! Later, he would attend at the University of Strasbourg and after a short spell of National Service in the Navy, he would finish his education at Oxford, where he received a degree in French and Russian. On leaving Oxford, Norwich joined the Foreign Service in 1952, where he remained for twelve years, with assignments in Belgrade and Beirut. During this period in his personal life, he would marry twice, somewhere in between he would also have an affair which resulted in his beautiful daughter, Allegra Huston, being born (but that’s a story for another time) and upon his father’s death he would inherit the title Viscount Norwich and eventually leave the Foreign Services for a life as a writer. His first outing as a writer was a book on Mount Athos (1966) written jointly with Reresby Stitwell. 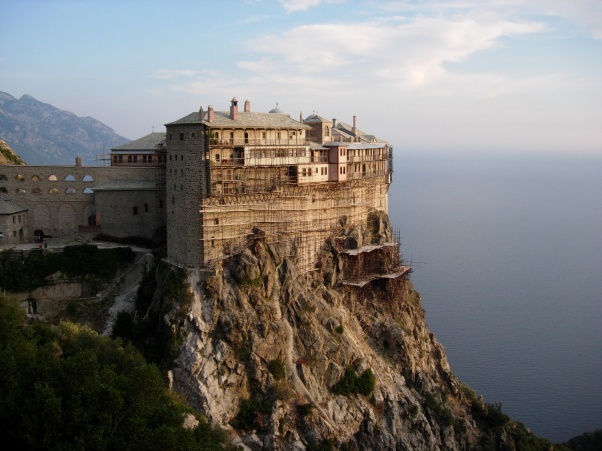 He states in his introduction in Byzantium: The Early Years that it was no coincidence that this would be the topic that he would first write about Mount Athos. He had been captivated by the Byzantine and the Eastern Mediterranean world ever since his first visit to Greece and then subsequently through his time in Belgrade and Beirut in the Foreign Service. The Eastern Mediterranean with its heart in Constantinople was a glorious civilization, but one that with time had become neglected and forgotten. I asked Lord Norwich with the time that he had spent in Belgrade, why is the history of Eastern Europe or the Balkans so misunderstood or neglected? 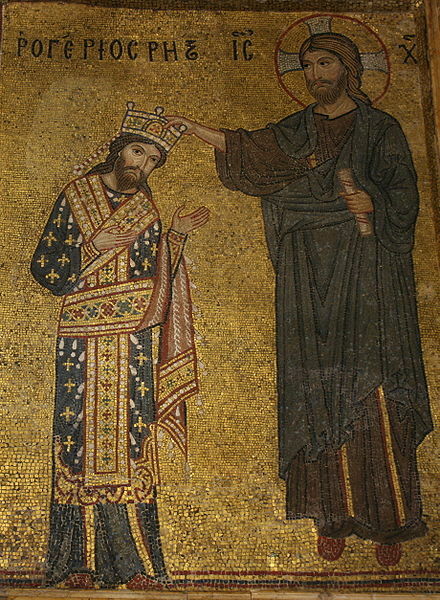 Detail of the mosaic with Norman King Roger II receiving the crown from Christ, Martorana, Sicily. JJ following his first endeavor into the literary world would go onto write about places, people, empire and conquest. His unique experiences of having travelled the world had given him a great insight into topics he would cover later on. His fascination, in particular, with the Meditterranean world led him to write two books (both later published in 1992 as a single volume) on the medieval Norman Kingdom in Sicily; The Normans in the South (1967) and The Kingdom in the Sun (1970). Critics agreed that it was an astonishing account of the Normans of the twelfth century. A real melting pot of language, religion and tolerance; where ‘the navy was in the hands of the Greeks, the treasury in those of the Arabs, while (the Normans) exercised quiet overall control’. Writing, reading, spending days and months on end in London libraries would become a necessary evil for Norwich and possibly drive anyone else out of one’s mind. Coffee and/or tea breaks would go hand in hand with research that could be tedious and very time consuming. Many great writers often vanish into the fabric of libraries never to be seen again ! Speaking of great writers, Norman Davies, wrote a book recently called ‘Vanished Kingdoms’, some remembered and others long forgotten. I asked JJ was there a vanished ‘kingdom’ he found interesting enough to talk or write about? Indeed, Venice has been a labour of love to Norwich since his first experience there in the summer of 1946. In his book ‘A History of Venice (1981) he remembers his first experience being short and intense, limited to two buildings, the Basilica of St.Marks and Harry’s Bar. For the rest of his time there he recalls they wandering around with his parents on foot or being gently carried along its waterways by gondola. His father talked about its history leaving a young 16 year old craving for more the next time they were there. When his father died in 1954, he had left a substantial collection of books and a few notes on Venice which were intended for his unwritten history. A need to write a history on this beautiful city was then something Norwich himself would have to do. Subsequently, since then JJ had sat as chairman of the Venice in Peril Fund for nearly thirty years. He has seen through his own eyes how Venice has and still desperately struggles for its survival. Venice in peril ! Flooding has become a common occurrence. My next obvious question to Lord Norwich was how could we save the city of Venice or will she become a ‘vanished kingdom’ too? Approximately, some 50,000 tourist visit Venice every day- more than the entire population of the city itself. It equates to around 15-20 million visitors per year, a number way to high Lord Norwich strongly points out. 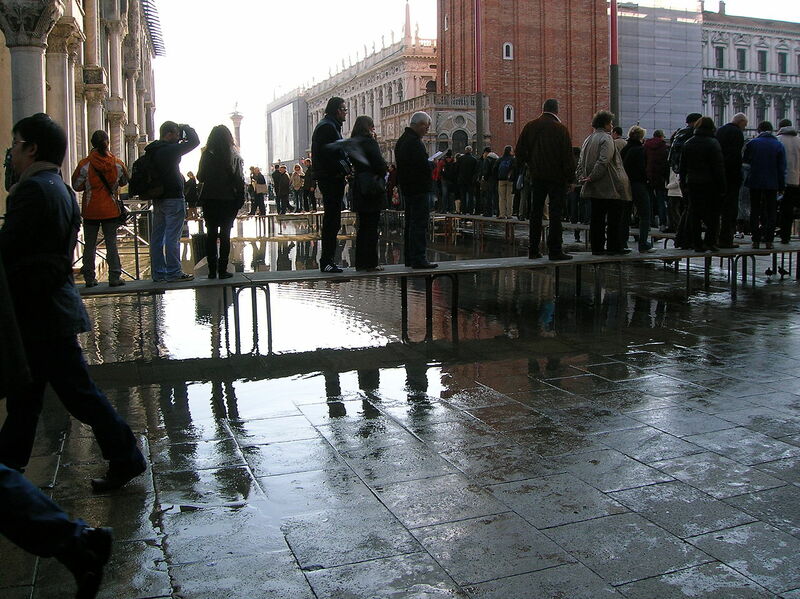 By reducing the numbers of visitors dramatically, this would give Venice a chance to restore its identity beyond today and protect it from those who exploit her special status and by doing this it will empower its remaining citizens to reclaim their identity. Banning those huge cruise ships also seems like a logical first step in saving Venice. They are an obvious danger in clogging up the canals and the possible environmental dangers or ecological effects that they may pose. From this it does seem Lord Norwich isn’t shy on subjects of importance and speaking his mind on things that matter greatly to him. I once read that he said he ‘loathes all this political correctness’ today. I believe political correctness sometimes gets it in the way of a good story and/or the truth. I put it to him and his futher thoughts on the matter. 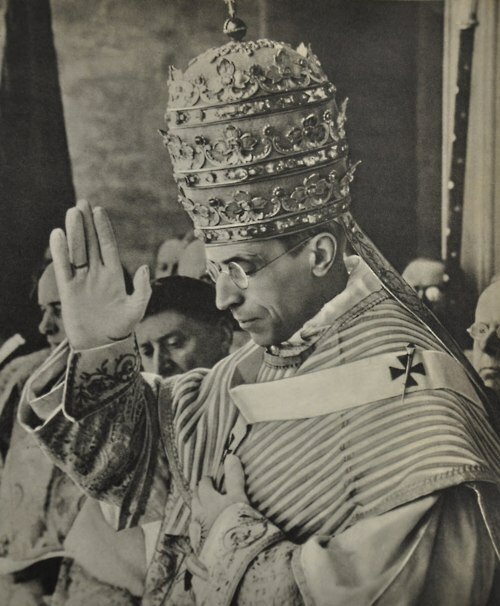 On another matter a few years ago, Lord Norwich hit a nerve with some critics with his book The Popes (2011)and in particular his disparaging assessment of Pius XII. Critics called him ignorant and out of touch but in November last year, he still stood by his assessment of Pope Pius XII as ‘the odiously anti-Semitic Pope’ at his address to the Royal Institute of Great Britain. I asked him if those critics had swayed his assessment of him today ? In his introduction of The Popes he makes it very clear that as an agnostic Protestant, he has ‘absolutely no axe to grind, still less any desire either to whitewash the papacy or to hold it up to ridicule.’ He just wants to present the facts that are in front of him, and if that means ruffling a few feathers, so let it be. He ends his journey of all the Roman Catholic Pontiffs with Pope BenedictXVI. His assessment of him is unclear, ‘we shall just have to wait and see’. But with another new Pontiff recently elected, I asked Lord Norwich whether or not he thought the current Pope Francis was doing a good job ? Lord Norwich has been an important influence upon this bloggers life, in relation, to the subsequent books I have read and leads I have followed in my reading of history. Others can judge him how they like, but many agree he is a gifted English historian and sometimes television and documentary presenter. He will undoubtedly continue to lecture around the world, so as the mind and body let him. He’s written works also include acclaimed books on Shakespeare, English Architecture and a series of short anecdotes, trivia and witticism collected from history and literature called Christmas Crackers. A few years ago he also wrote his autobiography titled Trying to Please (2008). But there are also some other exciting historians out there like Judith Herrin, Roger Crowley and Lars Brownworth that I have read. I asked Lord Norwich if he had read any of these? Like Norwich, Roger Crowely has written a magnificent account of Venice history entitled City of Fortune: How Venice Won and Lost a Naval Empire (2011). As we say goodbye for now, I asked Lord Norwich one final question on how he thought history would be taught in the near future and had we lost our minds in this digital age? Photo credit: All images are in the public domain except the header image of Lord Norwich which I use under the rationale of fair use for educational purposes and because no free alternative seems to exist. The Venice cruise ship image is licensed and used courtesy of Getty Images embedding service. This is terrific! Norwich’s Byzantium books are the major source texts for my “Cry For Byzantium” Twitter account. I love them. Thanks Sean. I was truly surprised when JJN emailed me back. I only wish now in hindsight I had asked him some more questions. Didn’t want to push my luck ! Truly amazing interview by fellow history blogger Robert Horvat with John Julius Norwich, the British author most famous for his “Byzantium” trilogy–which is the main source material for my Twitter feed CryForByzantium. Terrific interview, and I’m very envious that Robert got to chat with him! Well done! Outstanding write-up, Robert! I’m currently working on a novel in which my heroes muck about in 8th century Byzantium, so I am quite familiar with the eminent John Julius Norwich. How delightful that he write you back! Ah, Byzantium! Such a sparkling, beautiful, corrupt place – just the way I like it! Enjoy this most excellent write-up on one of the premier historians of Byzantium, and more, as well. Hello! I stumbled upon your write up (which i very much enjoyed) while looking for information on his religious life. Could you tell me how you found out about his agnostic Protestantism? Thanks for reading Mari. Lord Norwich and I did not discuss his agnostic views but if my memory serves me correct, he touches on it in his introduction of his book The Popes. Furthermore his autobiography is a great resource about his life and views. Nice article. I just finished reading Byzantium: The Early Centuries, and wanted to learn a bit about Norwich. Glad I found your site. His three volume series is quite an enjoyable read. Great for a beginner to familiarise themselves with the world of Byzantium. I hope you find more on my site that interests you.